Avoid the spa treatments and time consuming laser sessions! 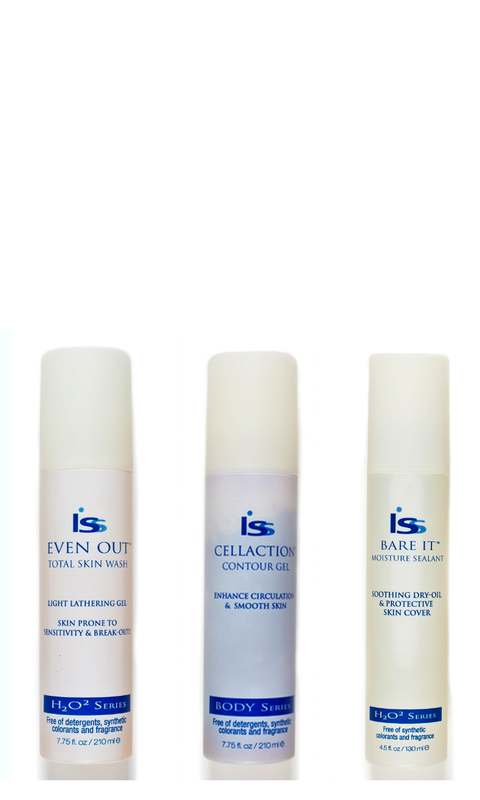 With the Cellaction™ Body Firming Kit, you are supplied with three products that bring the spa home to you. In as little as five minutes per day, you can work towards clearer, firmer, and softer skin. 1. Even Out is a detergent-free, herbal, skin wash calms skin prone to flare-ups. Formulated with soothing and antiseptic extracts that are known to relieve discomfort due to inflammation, itching and skin irritations. Even Out, removes impurities and restores balance to the skin. Ideal for facial cleansing on acne, oily and combination skin and as a body wash for skin prone to breakouts on back and shoulders or overly dry parched skin. Use: Apply a dollop of cleansing gel to wet fingertips and massage into skin. Work into light lather to gently clean off make-up and debris. 2. 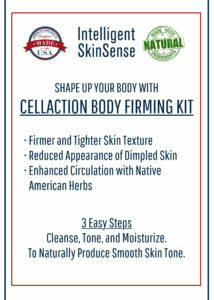 Cellaction is formulated with astringent Native American herbs and Pronalen®, a patented anti-cellulite blend. This invigorating cool gel is fast acting to awaken sluggish skin and diminish the appearance of cellulite. Cellaction works best when the skin is naturally warmed and recommended to use prior to exercise or directly after bathing and before retiring at night. For Cellulite: Apply to cellulite affected areas. Massage firmly into the skin. For Circulation: Apply to entire body beginning at the feet. Massage cooling gel well into the skin. For Water Retention: Works best when the skin is naturally warmed and recommended to use after a bath or shower and before retiring at night. 3. Bare Itprotects exposed skin with an invisible skin cover. The soothing aromatic oil softens the skin while fruit extracts and vitamins provide an anti-oxidant defense system against free radical damage. This featherweight silicone and natural oil blend dries in seconds, and leaves the skin feeling likesilk. Bare-It Oil is free of parabens, synthetic fragrance and color. Face: After moisturizing, spray one to two pumps to the palms of your hands. Pat on top of moisturizer to face and neck. Body: May be used on top of body lotion or alone as a moisturizing body oil. Spray directly to the skin and massage in. Hair: Apply a small amount of Bare-It-Oil to the palms of your hands and then work into the ends of the hair to add luster and condition the damage tips of the hair. Pre-Bath Conditioner: Apply Bare-It-Oil to your body and then soak in bath water. Bath Oil: Add four spritzes of Bare-It-Oil to the bath water and soak to soften and condition dry skin.